Contents. List of Contributors. Preface (S.K. Malhotra). Fluorescent IN SITU Hybridization (FISH) as an Adjunct to Conventional Cytogenetics: Analysis of Metaphase and Interphase Cells (H.F.L. Mark). The Contribution of Defects in Insulin Signaling in Skeletal Muscle to Insulin Resistance and Type 2 Diabetes: Cellular and Molecular Aspects (K.C. McCowen and E.D. Abel). Cytopathic Hypoxia in Septic Shock (D.R. 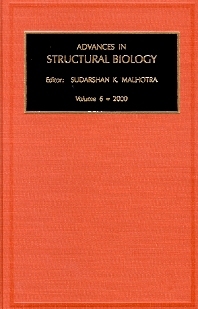 Schwartz, A. Malhotra, M.P. Fink). Bone Healing and the Differentiation of Osteoprogenitor Cells in Mammals (D.E. Ashhurst). Polyamine-Traveled Pathways: Significance in Health and Disease (U.R. Tipnis). Reactive Astrocytes, their Roles in CNS Injury, and Repair Mechanisms (J.L. Ridet and A. Privat). Plasticity and Rigidity in the Nervous System: Lessons from the Spinal Cord (H. Aldskogius). Ceruloplasmin: Structure and Function of a Ferroxidase (S. David and B.N. Patel). Expression of a Novel Nuclear Protein as Correlated with Brain Development (A. Raghunathan and M.C. Vemuri). Structure-Function Relationships of the Nuclear Envelope (C. Maske and D.J. Vaux). Membrane Pores (C.L. Bashford and C.A. Pasternak). Index. In keeping with the broad objectives set for the serial publication of Advances in Structural Biology, Volume 6 contains exhaustive articles from experts in diverse areas of biomedical research. The common thread among the various articles is their relevance to the applications of cell biology to human health.